It's probable that in your life, you might lose a tooth, or a few, or a lot of your teeth due to an accident, decay, natural aging, or other factors. Until recently, if you lost a tooth or teeth, you could only replace them with a bridge or removable dentures. But with all the new techniques and technologies in modern dentistry, you now have the choice of replacing missing teeth with custom restorations attached to dental implants. Designed to feel natural and function just like real teeth, dental implants can repair your smile if you're missing one tooth, a few, or all of your teeth. If you're interested in a custom dental restoration that looks attractive and lasts, ask your dentist in Columbus, OH to tell you about implant dentistry. At DentalWorks - Easton, we offer high-quality dental implants for patients who need a crown (one tooth), a dental bridge (a few teeth), partial dentures (most of the teeth), or full dentures (all of the teeth on one or both arches). If you've been blowing off your missing teeth or you're disappointed with removable dentures, you might be a great candidate for an implant-supported restoration. A dental implant is a titanium post that is screwed through the gums into the jaw. When the implant(s) has integrated with the bone and gums, it will be strong enough to connect to a custom restoration. At DentalWorks - Easton, we perform implant surgery with sedation dentistry to keep patients calm and comfortable during the procedure. We also offer high-quality restorations (crowns, bridges, and dentures) for beautiful results. Depending on which restoration is required, one or several implants could be placed to ensure your new restoration is strong and stable. Our staff at DentalWorks - Easton will provide you with fantastic care and understanding when we guide you through implant surgery and getting your new restoration. When a tooth or teeth are missing, it can cause multiple problems. The space left by a missing tooth might permit the neighboring teeth to shift out of alignment. A dental malocclusion can cause problems, like temporomandibular joint disorder (TMD). Additionally, when there's no root to keep the jaw and gums actively stimulated, atrophy can cause other dental problems and eventually, a sunken facial structure. 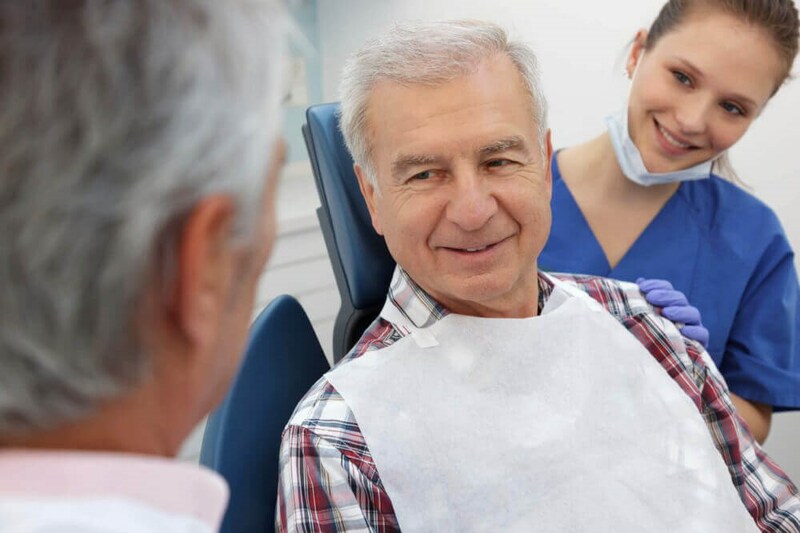 Unlike traditional removable dentures or a crown and bridge that is glued in place, an implanted restoration keeps your jaw and gum tissue healthy. Another major reason Columbus, OH patients are enjoying their implanted restorations is how natural they look and how they function like natural teeth. Dental implants integrate with your jawbone and gums so the attached restoration is stable enough to eat almost all foods and it requires no special attention. Once the implant-supported restoration is in place, your teeth should be brushed and flossed twice per day, plus you need to schedule professional cleanings and exams at your dentist in Columbus, OH. In comparison with traditional crowns, bridges, and dentures, implant-supported restorations last longer with proper care. Implanted crowns can replace one lost tooth. Once the dental implant has integrated with your bone and gum tissue, then a customized crown will be attached. The crown will be colored and shaped to blend with your other teeth to deliver a seamless result. For additional stability, an implant can be attached to a dental bridge. An implant-supported bridge uses one implant that is attached to one false tooth, which is also connected to crowns that are placed over the surrounding teeth. To replace many, but not all of the teeth on a dental arch, supported partial dentures can be used. Dental implants will be carefully placed and then attached to the custom-made partial dentures. If you are missing all of your teeth on your upper and/or lower arch, implant-supported full dentures are a good choice. After multiple implants are placed and have integrated with your gums and jawbone, dentures will be attached. When you and your Columbus, OH dentist have determined that a restoration supported with an implant is appropriate for you, your implant placement surgery will be scheduled. Before your surgery, your dentist will use digital x-rays and other state-of-the-art imaging to help create a chart of the best location for your implant(s). On the day of your surgery, you will need to adhere to any pre-procedure instructions given by your dentist. At DentalWorks - Easton, we offer many different levels of sedation to keep you relaxed during implant surgery. When you are relaxed and your mouth has been prepped, a small incision will be made in your gums and set the post in your jawbone. This process will be repeated if multiple implants are required. Once the post(s) is in place, the incision(s) in your gums will be closed with stitches. The visible portion of the implant post(s) could be capped with a temporary restoration for protection while your jaw and gums heal. Your dentist may prescribe antibiotics, pain medication, and/or anti-inflammatories to help your recovery. You should plan to rest as much as possible after surgery and stick to a liquid or soft foods diet. You will need to schedule your next appointment around one week after surgery to have your stitches removed and so your dentist can check your progress. It should take approximately 3 – 6 months for osseointegration (the implants integrating with your natural bone and tissue). During this time, you may be asked to schedule follow-up appointments at your dentist in Columbus, OH so they can check your progress and estimate how long it'll be before your restoration can be placed. Once your implant(s) is ready, your dentist will complete the process. While your final appointment should be pretty easy and cause minimal discomfort, local anesthesia along with nitrous-oxide gas or an oral-conscious sedation method could be administered to keep you relaxed. As soon as your temporary restoration has been removed, your dentist will attach your customized restoration to the implant(s) and may make little adjustments as needed to improve the fit and appearance. Before you go home, your dentist will go over how to best take care of your restoration and implant(s). One of the key benefits of implant-supported restorations is that they can be treated just like your regular teeth. You can still eat corn on the cob, caramel, and your other favorite foods without having to deal with your restoration getting pulled out. However, it is crucial to care for your teeth with a good home oral care routine. You must brush and floss your restoration and natural teeth at least twice a day. If you need help with your cleaning technique, our team at DentalWorks - Easton is happy to demonstrate and give you tips during your appointment. You should continue to attend your annual oral health exam and bi-annual cleanings with your dentist in Columbus, OH. In some cases, your dentist will recommend coming in more often for exams or cleanings. While restorations attached to implants are long-lasting, you may need to have them replaced. During your annual exam, your dentist will check the wear of your restoration and health of your implant(s) so they can recommend if you need a replacement. Implant-supported crowns, bridges, and dentures can revitalize not only your smile, but also your life. Implant-supported restorations improve the appearance of your smile and get you back to daily activities such as eating, laughing, or talking with others without the worry of a gap in your smile or a restoration coming loose. Whether you replace a single tooth or a few missing teeth, implant-supported restorations can restore your confidence. To get more information, contact our office in Columbus, OH and schedule an implant and restoration evaluation.